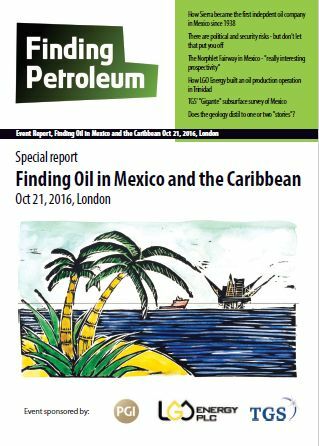 The Gulf of Mexico/Caribbean is a fascinating petroleum province, surrounded on 3 sides by the US Gulf of Mexico, and Mexico’s and Venezuela’s mainly onshore riches. And then in what we could call the outer island chain, Trinidad has a long history – from the early part of the 20th Century – of onshore oil exploration and production and major offshore gas production, Barbados has minor oil production onshore (~1000boepd if I remember rightly), and Jamaica and Cuba have ambitions to get exploration under way. So a big area to contemplate with many petroleum systems. Do we understand this complexity and is it possible to predict that are remaining unexplored, potentially prolific, plays and if so where are they? Is there a regional theme or are these simply a set of unconnected country-based petroleum provinces sitting aroud one large basin? Mexico: An overview of the investment and operating climate. Tom will analyse the key political, security and regulatory challenges of investing in the Mexican onshore and offshore markets. The presentation will assess the progress of Mexico's licensing rounds to date and the key ongoing investment considerations or companies in country. It will detail local political dynamics in Mexico and assess the security picture affecting foreign companies, with a particular focus on oil and gas operations. Mr Ritson holds a Bachelor degree in Geophysics. He has worked in the energy sector for over 35 years’, initially with BP plc, where he held the roles of International Chief Geophysicist, Head of Geoscience Research and Business Unit Leader for both Norway and Alaska Exploration. Subsequently Mr Ritson managed the international operations of Burlington Resources Inc. and more recently he was CEO at Regal Petroleum plc before founding the Vanguard Energy Group where he was Chairman and CEO. Mr Ritson is the Chairman of Solo Oil plc, the Managing Director of NR Global Consulting Limited and a Director of Marylebone Consulting Limited. He is also a Non-Executive Director of Enovation Resources Limited, a Bermudan registered private company active in the UK North Sea. LGO Energy's operations comprise of four main Trinidad assets; the Goudron Field, the Icacos Field, the Cedros Peninsular leases, and Beach Oilfield Limited (BOLT) leases which include the Bonasse Field. The Goudron Field (LGO 100%) lies between the East Moruga and Beach-Marcelle fields in south-eastern Trinidad and has direct access to the Petrotrin oil export pipeline to the Pointe-a-Pierre refinery in western Trinidad. The field was originally discovered by Trinidad Leaseholders Limited in 1927 and was largely developed by Texaco between 1956 and 1986, when ownership passed to Petrotrin and its predecessors. A field reactivation contract, Incremental Production Service Contract (IPSC), was signed in late 2009 and the contract acquired by LGO in October 2012. Since then LGO has reactivated over 70 wells and drilled 15 new deep production wells and is gearing up for an infill program of up to 70 new shallow wells and a waterflood EOR of the deeper reservoir. LGO's recent drilling has increased the oil in place estimate substantially and now stands at close to 1 billion barrels. The Icacos Oilfield (LGO 50%, Touchstone 50%) lies on the SW Peninsular (SWP) of Trinidad and is surrounded by a number of LGO's 100% owned petroleum leases. The BOLT leases also lie within Trinidad's south-west peninsular and taken together LGO has a dominate land position in a major underexploited part of the East Venezuelan oil belt. LGO has recently acquired a country-wide FTG gravity survey as well as 3D seismic and soil geochemistry data in the SWP and has defined significant undrilled prospectivity.